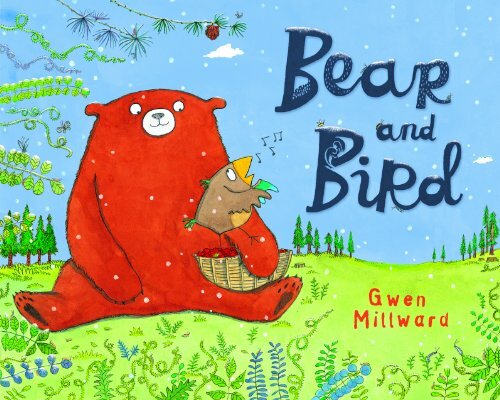 This thoughtful book about a bear and a bird explores the nature of true friendship against the background of seasonal changes in a beautiful forest. In their life together each contributes in their own way, albeit Bird’s main contribution being song whilst Bear bears the onus of required work! With a hard winter ahead, they store as much wood as possible. After Bird foolishly uses their entire log supply one very cold night, we see Bear plod off alone to gather wood. Hours pass without Bear returning, so Bird sets off into the dark to find him. As he searches he meets many woodland creatures. None has seen Bear but each is intent upon a mission to assist a friend in need of help. Bird realises again and again how much he is indebted to Bear for his own daily happiness, so when he does find Bear, lost and frightened, it is Bird who overtly shows his love, reversing the usual relationship. The pictures support the warmth (and chilliness) of the setting, each creature portrayed in earnest busyness.